Known as the “Tiger of Madras”, Viswanathan Anand has played for the World Championship 8(!) different times, winning 5 of these matches and being the reigning champion from 2007-2013. Known for his extremely quick speed of play, Anand was a prodigy who had a spectacular rise to the top of the world’s elite in a short time. One of the greatest players in the history of chess, Anand continues to be one of the elite players in the world. Viswanathan Anand learned to play chess when he was 6 years old and skyrocketed through the chess stratosphere. At the age of 14 he scored a perfect 9/9 in the National Junior Chess Championship. When he was 15 he became the youngest Indian to be awarded the International Master title and at the age of 18 he became India’s first Grandmaster. Anand was known for playing very quickly in his games and not sacrificing the quality of his play at the same time. 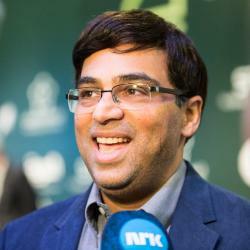 At the beginning of the 1990s, “Vishy” exploded onto elite chess scene, winning tournaments ahead of top players and qualified to play against Garry Kasparov in the 1995 World Championship and Anatoly Karpov in the 1998 World Championship. He lost these matches but a few years later in 2000 he defeated Alexei Shirov to win the title of World Champion for the first time. It wasn’t until 2007 that his reign as World Champion fully started though. It was in this year that he won the World Championship over 7 other players in a tournament and reigned as World Champion until 2013 when he lost to Magnus Carlsen. Anand continues to be rated among the top 10 players in the world.